The Inn at Grace Winery, located the historic Brandywine valley, is an exquisite venue. It boasts its gorgeous vineyards and a beautiful barn that features exposed wood beams and high ceiling with huge wagon wheel chandeliers. When photographing the wedding reception decor, we always strive to give our photos the sense of time, space and style of the wedding. The Inn at Grace Winery has that impeccable rustic feel to it, very romantic and intimate. And our final goal is always to tell a better story of your wedding day through the photographs. We wanted these reception detail photos reflect how it felt for everyone being present at that special wedding day at Grace Winery. This photograph of the wedding reception table setting was taken during the cocktail hour while the room was still empty. All the candles were already lit which provided for warm and soft ambience in the barn. The guest tables were beautifully lined up and were set with some marvelous rustic decor. When photographing a wedding, it is very important to highlight all the hard work that the bride and groom have completed preparing for the Big Day. The reception decor is something that represents the personal style of the couple, rends the feel of the wedding, tells a story of the day in brighter colors and simply sets the mood of the entire event. These photographs also serves as great additions to the final wedding album design. We took this picture without using any addition light. 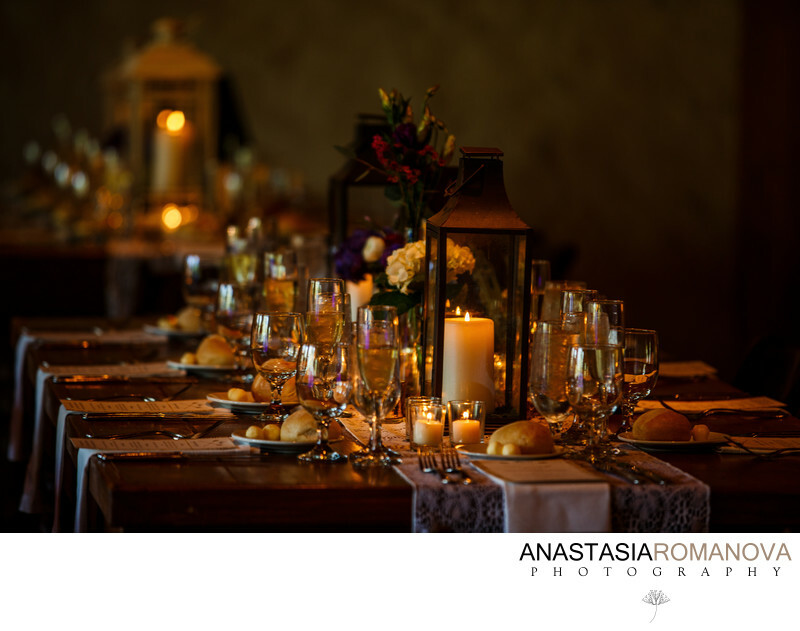 It was all ambient light coming from the candles which created this subtle romantic atmosphere.